Logging In: You can help your faculty access their account by resending the invitation to Interfolio. That email will prompt your faculty member to create a new password and help them access their account. If your committee members experience any trouble, they can select "Forgot your password?" from the Interfolio home page. . Requiring Confidential Letters of Recommendation: Don’t forget! In order for an applicant to apply to your position, they need to complete all requirements before they can submit. That means, fulfilling each required document slot and completing all required form questions before they can submit their application. Collecting Additional Documents from a Subset of Applicants: A common strategy for narrowing down a large applicant pool is a two-stage search. After you narrow down your applicant pool, you can request additional documents from the smaller list of applicants. 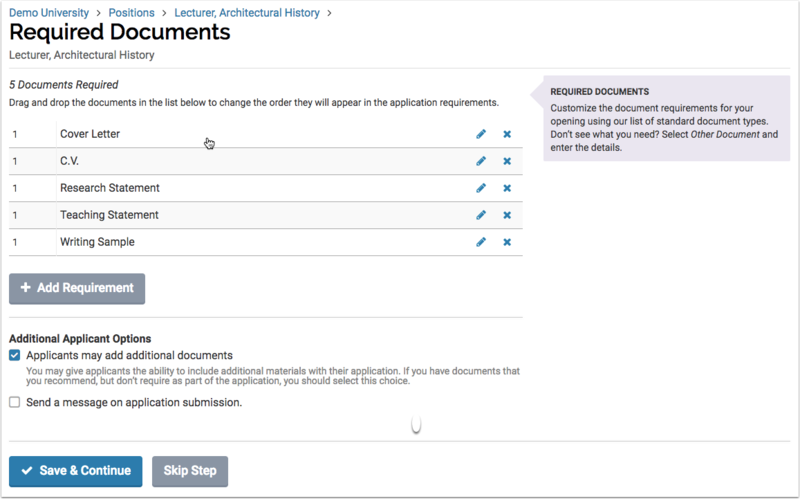 Don’t forget to add additional document requirements (if necessary), and make sure to edit either the Position Status or the Application Status to permit those applicants to update their application materials. (For Committee Managers) Don’t see the position you’re looking for? It’s possible that you may need to change your role so that you can toggle your scope within the institution, school, college or department. Learn more about our user roles here. Landing Page Analytics: Wonder how your applicants are finding your positions? We now have a tool that shows a simple pie chart illustrating how your potential applicants are accessing your position’s “Apply Now” page. This handy chart can help you learn whether your recruitment dollars are paying off—why pay to post someplace that no one goes? If you aren't getting the applicant pool you expected for whatever reason (not diverse enough, not competitive enough), you can see which job boards are getting applicants and switch tack, if necessary. Additionally, we have guidebooks for every user type where all relevant articles for your role are sourced for you. The fifth resource listed is a webinar our Client Success team hosted back in August 2016. It’s a comprehensive training covering how to create and manage a search in Interfolio.